Stadium Mycra Pac Size Chart is now available. The Stadium Rain Jacket as a different fit compared to the popular Donatella raincoats. Going In Style's new Stadium Size Chart will help you find the perfect fit. The Stadium Mycra Pac Raincoat offers a slim, sporty fit compared to the Donatella style raincoats. Fitted at the shoulder with shoulder seam, the Stadium Raincoat offers a more structured fit than the Donatella style raincoats. The column silhouette fits straight up and down through the bust, waist and hips. A zippered closure starts below the hip and zips up all the way to the neck for full protection from the rain. Zipped inside the collar of the rain jacket, is a thin, lightweight hood. The hood of the Stadium rain jacket is smaller and thinner than the Donatella Raincoat. 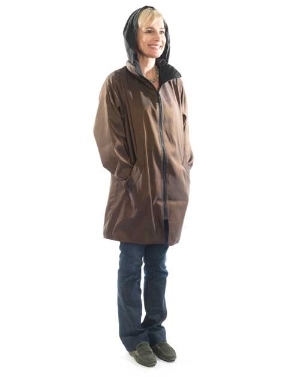 Returns for the Stadium Rain Jacket are generally made because the coat is fitting too tight around the waist and hips. Customers will have trouble sitting down comfortably while the coat is zipped up. On the other hand, returns for the Donatella Raincoats are usually made because the coat is too large.